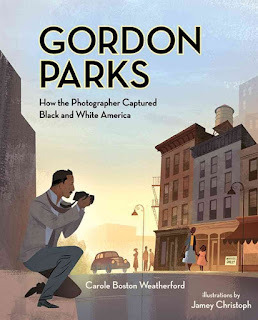 I am ashamed to admit that I had never heard of Gordon Parks until I heard about the new picture book biography about him and his photography: Gordon Parks: how the photographer captured black and white America. Briefly, Gordon Parks was born in 1912 came of age in Jim Crow-era America. As a photographer, he sought to bring to life the trials and tribulations of African-American lives, including those of the working poor. He was the first black photographer for Life magazine and the first African-American to write and direct a feature film. His images are immediately iconic and powerful. He is a photographer worth knowing. If you, like me, did not know about Gordon Parks, I encourage you to seek out his work and learn more about him. Legends Online has a collection of 20 images by Parks, along with a summary of their background and impact, which are well worth viewing. Huffington Post has an article including information (and images) of several "never before seen" Parks shots from the 1950s. There is even a Gordon Parks Museum and Center for Culture and Diversity, located in Fort Scott, Kansas. This year's annual photography competition is open to amateurs only this year, and the deadline is October 1st.